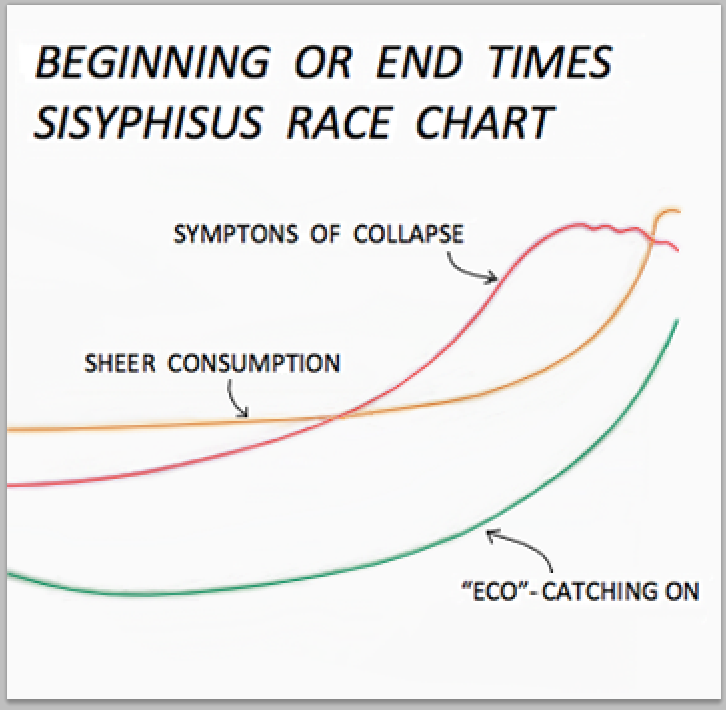 The Sisyphus Race – Race to the Start not Finish? 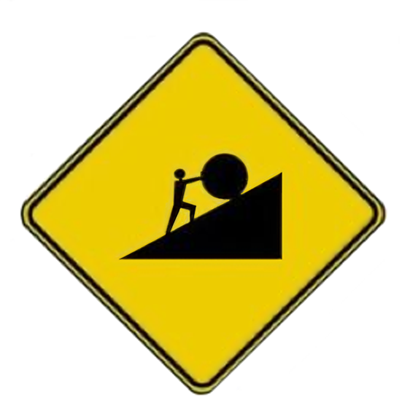 I woke up yesterday thinking of the Greek myth of Sisyphus, the guy condemned to forever be struggling, pushing an enormous rock up the hill, only to see it break away and roll back down. Repeat. Repeat. Repeat… Sometimes pursuing the elusive “ecocity” feels something like that. 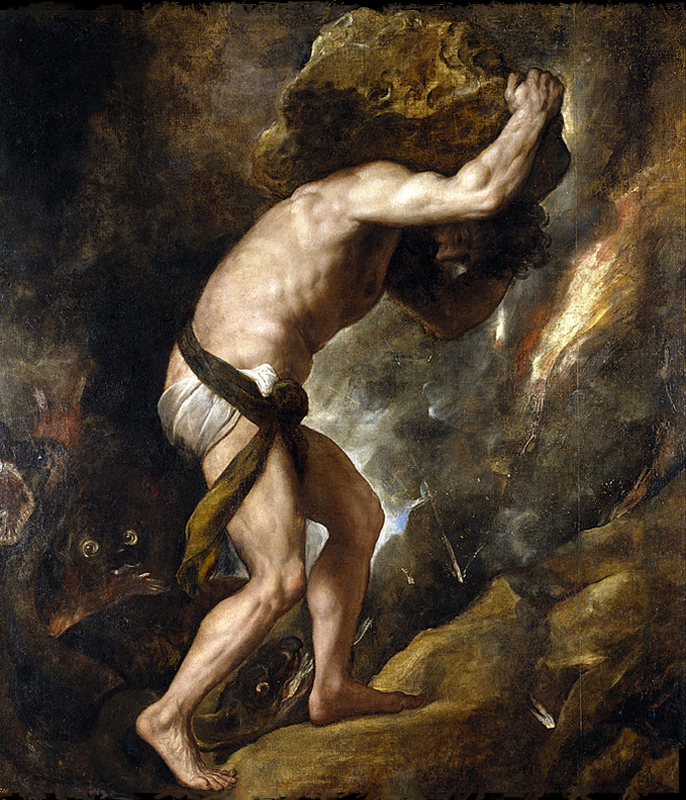 Zeus condemned Sisyphus to that punishment so the story doesn’t fit that well – nobody has condemned us pursuers of the city in extreme good health, in fact we are sometimes lauded for our efforts among some very thoughtful people. And, in fact, we are self motivated with no one – Zeus or anyone else – with the power to condemn us and make us push that particular rock up that daunting hill, with the setbacks sending us back to ground zero, or in our case, back some but never to ground zero. It’s our choice or we don’t try it. So the metaphor doesn’t fit that well. But it unlocks some possibilities interesting to contemplate. I first thought about the positive potential of this myth, remembering as I was yawning and stretching yesterday morning, when reading a talk given at the International Institute for Applied Systems Analysis where my friend Joe Alcamo was then a research scientist in the late 1980s. (He’s now Chief Science Advisor to the United Nations Framework Convention on Climate Change. 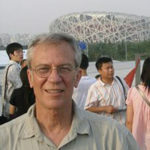 He was also one of our main speakers at our recent International Ecocity Conference in Abu Dhabi.) The talk I was reading just after returning from visiting Joe there in Vienna was by mathematician and humanist/evolutionary economist and peace promoting Quaker Kenneth Boulding. Boulding said imagine the hill actually has a top (most do!) and if we are not under the armed guard of someone actually condemning us, difficult though the task might be, and relentless as the setbacks might seem, there is the possibility we can actually get to the top and then the rock begins to roll in the direction we desire – and it’s a whole new world. The struggle becomes a relatively easy stride into a whole new range of possibilities of a different nature. Boulding suggests that has happened with slavery and dueling, two curses of society that eventually passed over the top and everything was different. True, there are small pockets where the near equivalent of slavery exists, and perhaps some strange eccentrics with simultaneous quirks of mind and extreme mutual disregard go at it in a duel maybe somewhere. But as an accepted and general tradition and part of human history – by now long gone. One might think “the Change” when the Soviet Union collapsed, as my friends in Bulgaria called it when I was there in 1992, and the radical reduction of likelihood of nuclear war fit his construct too. For war in general, suggested Boulding, maybe we can grow beyond our seemingly Sisyphusian struggle, get over the top and into a new world of very active, secure and creative peace. Now days we are deep into a war of another kind, the World War of humans against nature. But there’s the sustainability crowd in which us ecocity fans and promoters play an important part on a big team on the positive side, while ancient habits of exploitation, violence and oblivious disregard for nature are leading to that condition I’ve brought, graphically in a chart, to this newsletter twice already: science writer Vaclav Smil’s stats reveal less than 3% of the mammal biomass on the planet’s surface is wild and free any more while more than 97% are either us humans by weight – 31% of the total mammal flesh on the planet – or our food and pet mammals – 66%. Then there is the extreme and still rapidly growing population itself and consumption of materials and energy per person even more rapidly growing, and maybe finally, maybe the beginning of the unwinding of practically everything: the spread of failed states in the middle east and Africa, not insignificantly influenced by interference from our own, Russian and some other “better off” (temporarily?) countries of the world. Part of the pattern is seen in the growing almost panic in some parts of Europe as people from the middle east (war) and Africa (overpopulation and extreme poverty) are “dying to get there” – literally dying by the hundreds a month drowning in the Mediterranean Sea. visual presentations of for decades now; they are beginning to be built and are ever more commonly appearing around the world: green roofs and walls, attached solar greenhouses and plazas being rejuvenated for pedestrians and built into new projects. Also, awareness and application of “passive solar energy gain” building design, bridges between buildings providing enhanced accessibility to people on foot, pedestrian areas expanding, “density” being a dirty word in ever smaller circles and rebellion against the boredom of non-face-to-face life in the lonely suburbs as they are losing their decades-long mystique and mistaken attempt at achieving both city and nature at the same time with cars as the instrument of deliverance – which didn’t work out. Instead people are waking up to realize the suburb is quite “sub” to the urb and maybe the compact pedestrian ecocity is the way to get both city and nature all within a relatively easy walk, bike or public transport ride. So we have then a race going on at the same time we see some patterns of the Sisyphusian drama in action, with unknown potential as well as the usual pitfalls of the same old reversals to bad habits of way out of balance exploitation and war. The race to the start of a new era suggested by the combining to the up-hill struggle and the reality of the race to either the finish – of rich biodiversity, prosperity and justice on Earth – or the beginning of the same, as we the forces of life pass over the line, i.e. the top of the hill, before the opposition. Just to think about the nature of such a race, in Boulding’s way, and to look for key ideas for winning this race for a future strikes me as an approach with almost unimaginably powerful and positive potential. I have a special perspective on such things in that I was employed by the Exploratorium in San Francisco – I made some tactile sculpture there in the mid-1970s – under the visionary founding and nurturing of a truly wonderful man named Frank Oppenheimer. I recently read the biography of Frank Oppenheimer, Uncle of the Atomic Bomb as he used to joke, as his brother, J. Robert was scientific head of the Manhattan Project and known as “the Father of the Bomb,” on which Frank worked as well. Frank I knew as my boss, more or less, in as much as he was anyone’s boss at the Exploratorium where freedom to create reigned supreme. The book is called Something Incredibly Wonderful Happens – Frank Oppenheimer and the world he Made Up by K. C. Cole. A lot wonderful happens when you read it. 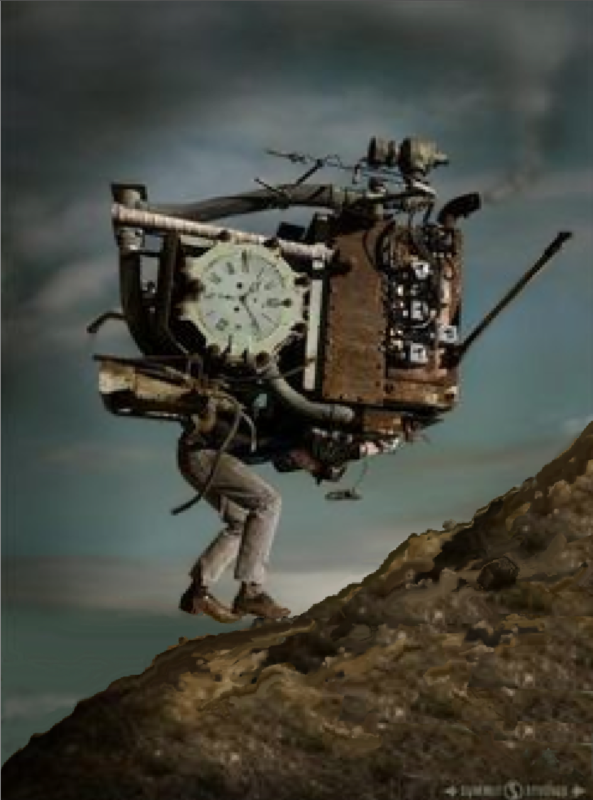 A more modern day Sisyphus from steampunk.com on the Internet, with minor alterations. always with us, and up until now, accelerating into human consciousness – if only conscience too! And therefore I’ve suggested we need to understand the essence of our present individual and collective set of changes in evolution’s normal direction as what should be evolution of co-equal consciousness and conscience: conscienceness. This is one of the main themes of my new book, World Rescue – an Economics Built on What We Build – read up and think! Call that “emergence” in the social, collective awareness in the universe that Paolo Soleri, and before him Pierre Teilhard de Chardin, and before him Vladimir Vernadsky called the “noosphere” or sphere of knowledge in the biosphere, the noosphere being mostly our human minds and all the information storage and exchange enhancements we have created. There are plenty of good things happening and never has humanity had such resources as science and technology now provide in terms of tools and good solid ideas – most of them hardly used that wisely. Steps toward ecocities are being taken – a very good sign. “Green” products and “fair trade” produce are both becoming pretty good in fact and important in terms of selling better things and services. Family planning is still against the religion among millions of people but recognized as valuable and crucially important and helpful by growing numbers also in the many millions. Many other good things are happening – racing with the negative trends all the way to manifestations in failing states beginning to proliferate. The race is definitely on. Maybe 1.) the idea of a race to a new beginning, not a race to the finish, planetary collapse being the finish, may in itself be a metaphor to help us get moving. Similarly 2.) the notion of the true difficulty of solving our problems like getting over the top of the Sisyphus mountain, seen in the way Kenneth Boulding sees it can make a big difference. Realizing like Robert Laughlin 3.) that a new world is always emerging and as Frank Oppenheimer points out 4.) that we are now making up our world as we go, may all be important tools to help us move forward to a better future. Read up and think! No graph or analogy is perfect in the swim of the vastness and complexity of our multiple mixed up realities. Much more is left out than contained in such representations striving for some scraps of real understanding. But maybe visualizing a few large patterns in relation to our race to the finish or another kind of beginning are based on proportions fairly well assessed and therefore helpful. Symptoms of collapse include our over exploitation of resources and the continuing increase in social disorder, fanaticism and spread of failing states – as negatives increase and the red line swings up meaning more of the bad things, the first signs of collapse (though we don’t know exactly what all of those signs are) begin to drag down the curved line in spasms of failure and partial recovery and new collapse as we see in Somalia, for example. The yellow line imagines total consumption quantity of mineral, energy and biological resources growing over time until the planet just can’t support it anymore. Include here pollution and other forms of damage slowing production such that at a certain point sheer consumption alone tops out and begins to fall. The green line is the good guys in the race against the destructive forces leading the whole system toward collapse. The green line is roughly the number of people “catching on to” awareness of “nature” the condition of the world and becoming engaged with trying to help. Will we make it? The down turn of the green line on the left side of the graph is saying we might have worked a little better with nature some centuries ago, if perhaps we simply didn’t have the numbers and consumptive technology to damage on the scale we do now, though also many earlier cultures consciously celebrated and honored nature and “Mother Earth” more enthusiastically than most do today, lost as we are in our technologies, material products-oriented and mainly in-doors lifestyles.